It is latest news that Candidates are required to fill online admission form on official website till 01st July 2015. The candidates are required to login their account to download admission form for getting admission to UG & BHMS Courses. Candidates will use password generated at the time of registration for logging into their account. It is advised to the candidates that they take care to fill Panjab University UG & BHMS Admission form and complete each section (Categories, Class +2 subjects, Weightages) carefully and lock each section. Then candidates are required to take print out of admission form and submit/send it along with the required documents to Coordinator, CET Admissions Cell, Department of Chemistry, PU, Chandigarh - 160014 by 1st July, 2015 (till 5:00 p.m.). 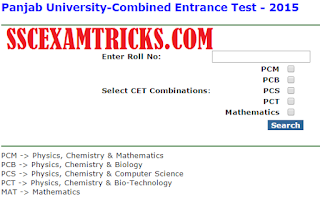 Panjab University Common Entrance Test 2015 result for Under Graduate (UG) and BHMS has declare now (tentative dates was on 03rd to 05th June 2015) on official website www.cetug.ppuchd.ac.in. PU CET 2015 UG & BHMS Entrance Exam was held on 23rd May 2015 (Saturday) at various centres (Chandigarh only) for getting admission in B. Pharm. (Credit based Semester System), B.Sc. (Honor’s School Semester System) in subjects of Anthropology, Geology, Bio-Chemistry, Microbiology, Bio-Physics, Mathematics, Biotechnology, Botany, Mathematics & Computing, Physics, Chemistry, Physics & Electronics Zoology and BHMS Course at Homoeopathic Medical College & Hospital, Sector 26, Chandigarh. A huge numbers of candidates had appeared in PU CET 2015 UG & BHMS Entrance Exam and waiting for their result. 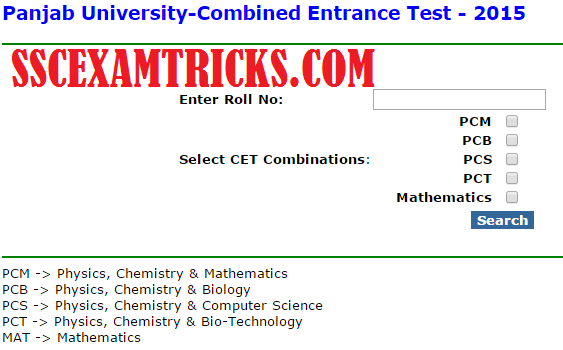 These candidates can download their PU CET (UR BHMS) Result 2015 from direct link provided below. Note: No separate PU CET 2015 UG & BHMS Result Card will be issued by Panjab University. 4:00 PM. Last date for uploading of photograph, signature with rest of the information on the website www.cetug.ppuchd.ac.in was 02-05-2015 (Saturday). A huge numbers of candidates had applied for PU CET 2015 UG & BHMS Entrance Exam from all over the state. PU CET 2015 UG & BHMS Entrance Exam was held on 23.05.2015 (Saturday) to Chandigarh centre only. PU CET 2015 was held in English Language only. PU CET 2015 UG & BHMS was objective entrance exam consisting six papers i.e. Paper 1, Paper 2, Paper 3, Paper 4, Paper 5, Paper 6. Each paper contained 60 questions each of 2 marks. The time duration for each paper was 70 minutes. · A candidate shall be included in a particular merit list on the basis of attainment of a minimum of 15% (cut off) aggregate of maximum marks in the test taken as a whole. · The admission to B. Pharmacy (Credit based Semester System) and B.Sc. (Hons. School) courses will be on the relative merit of the candidate on the basis of 75% weightages of PU – CET (U.G.) Entrance Test Score and 25% weightages for the marks obtained in 10 + 2 (12th class) examination.